22.04.1721, 3rd Subscription for South Sea Stock of £ 500 für Barbara Shirby, o. Nr., 12,6 x 16,4 cm, schwarz, beige, Knickfalten, Einrisse, Loch, OU Elizabeth Franklin, Anna Elinora Shirby. Rarität! 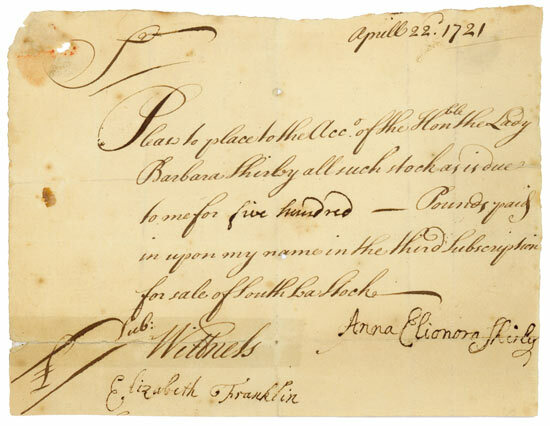 22 April 1721, 3rd Subscription for South Sea Stock of £ 500 for Barbara Shirby, o. Nr., 12.6 x 16.4 cm, black beige, folds, tears, hole, OU Elizabeth Franklin, Anna Elinora Shirby. A rarity!